Welcome back! I’m thrilled to be officially joining as a full-time author. I hope everyone had a chance to relax a bit over the holidays, and maybe spend a little bit of time on your favorite hobbies. This fall, one of my lab mates introduced my husband and me to a new hobby : spinning. No, not the exercise class, the yarn-making type. While we started with drop spindles, being the gadget-y people we are, spinning wheels were instantly fascinating. When we talk to spinners, they have regularly commented on how engineers take a very different approach to the whole process. Most spinners do it by feel, and trial and error, instead of evaluating everything in terms of gear ratios and frictional forces. The spinning wheel is hardly a new invention, and operates on fundamentally simple principles. 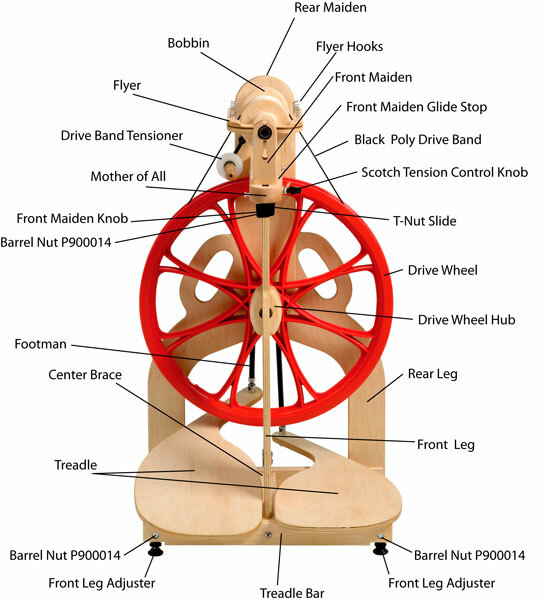 Twist is introduced into the fiber based on the treadle rate, and the flyer is rotated at a slower speed based on the gear ratio configuration of the wheel. The spinner’s hand controls the amount of twist introduced into the fiber. If you’re an engineer, you do things like calculate the gear ratio, and figure out that if you move the fiber one inch ever fourth time you treadle, you’ll get 8 twists per inch in your yarn. The drive band can be set up in different ways, but there aren’t very significant differences in the mechanics based on these changes. While my husband is more interested in the wheels, there are also interesting materials questions involved in spinning, depending on the kind of fiber you’re using. Fibers have several defining characteristics including composition, staple length, crimp and thickness. Cotton, for example, behaves very differently than wool, with much shorter and smoother fibers. It also has a waxy coating, and requires different treatments before the spun fiber becomes usable yarn. With wool, you have to be careful to avoid accidentally felting your yarn, which makes it stiff and hard to use. Learning to spin has been a lot of fun, and is a nicely portable hobby compared to cooking or garment making. Maybe it’s counter-intuitive to be interested in something so low tech, but I think that’s part of the appeal. What hobbies do you approach differently as an engineer? Great food for thought. Running is one of the non-engineering things I do, but of course I have spreadsheets to track each run, my miles, my weekly miles, speed, average speed, speed over time! I think that’s the engineer in me, love tracking and having data to look at.